Bentley J. Doyle passed away at Arden Wood, a Christian Science Nursing Facility on December, 15 2014. He and his twin brother Bernard, were born July 14, 1932, in British Columbia, Canada. Ben’s career in golf started at age 9 as a caddy at Vancouver Golf Club. In high school, he approached Ernie Tate, the Head Professional at Vancouver GC, about starting a golf program at his school. Ernie agreed as long as Ben would be his assistant. He played well enough to earn a scholarship to play golf at Western Washington University in Bellingham. During his time in college Ben met Joanne Smith, who was home on break from studying at the University of Oregon. The two were married in 1955. 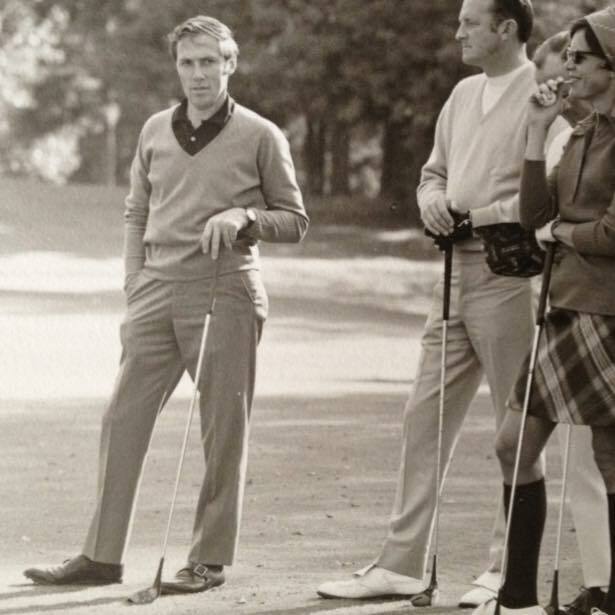 In 1961 Ben visited the Monterey Peninsula for the first time when he qualified to play in the Crosby Clambake, now known as the AT&T Pebble Beach National Pro-Am. Ten years later Ben and Joanne, with their three daughters, moved from the Seattle area to Monterey so Ben could pursue his dream to teach golf full time. For two years Ben taught at Laguna Seca Golf Club, picking-up the driving range by hand, before moving to Ed Haber’s Carmel Valley Country Club, now Quail Lodge Resort and Golf Club. Ben was recognized as a Golf Magazine Top 100 Instructor and a Golf Digest Top 50 Greatest Instructor during the course of his acclaimed teaching career. Ben was the 1st authorized instructor of Homer Kelly's book, The Golfing Machine, and was a beloved teacher to both amateur and Tour Pros alike. For nearly forty years he, and his golf cart, could be found everyday at his post on the far end of the driving range at Quail Lodge Golf Club, in Carmel Valley, CA. Ben worked with numerous Tour players and golf instructors throughout his career, but it was sharing his gift with his family that gave him the most joy. His sweetie Joanne passed away on Mother’s Day May 13, 2012. Ben leaves behind his daughters: Susan Mundle, Diana Van Vleck, and Lynda Baldauf; three sons in-law: Jeffrey Mundle, Jon Van Vleck, and Lasse Baldauf; three brothers: Donald, Robert, Norman and their families; sister in-law Carol Conrad and her family. Ben is also survived by six grandchildren: Bentley Mundle, Kaitlin Mundle, Maija Baldauf, Amy Baldauf, Drew Van Vleck, and Mason Van Vleck.